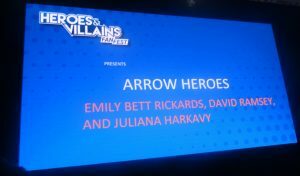 Hollywood News Source was at Heroes and Villains Fan Fest London last weekend and we attended the Arrow Heroes panel. The panel consisted of Emily Bett Rickards, David Ramsey and Juliana Harkavy. The trio took questions from a moderator initially and then the questions were opened up the packed crowd. 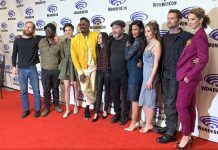 We learned a lot about how the show is to film even if we may not have learned as much as we wanted about the upcoming season. Check out a clip from the event which begins after one fan is particularly overwhelmed by the experience of meeting the cast who are quick to comfort her. Don’t forget to check out our Instagram page for even more coverage from Heroes and Villains Fan Fest.